Staff: Click here if you need help with Bitcoin. Yes! We love Bitcoin and we offer a 10% discount on all Bitcoin payments. At the moment, Bitcoin reservations require human interaction. If you would like to make a reservation using Bitcoin, please call us. During the call, we will ask that you send a deposit equal to the cost of the first night for each person in your party. 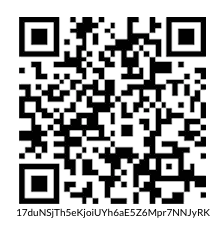 You should send all payments to this address: 17duNSjTh5eKjoiUYh6aE5Z6Mpr7NNJyRK or use the QR code on this page. As soon as we see your Bitcoin payment at Blockchain.info (0 confirmations required) your reservation will be finalized in our system. Unfortunately, at the moment we do not have the ability to process your $20 security deposit by Bitcoin. Each person will need to pay a $20 cash refundable security deposit at checkin. Notice to Tax Auditors: Pacific Tradewinds Hostel, LLC declares income on the fair market value of all Bitcoin received as of the date it was received. ‹ Do I need to pay a deposit?